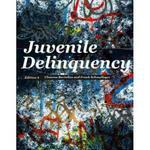 Juvenile Delinquency 9 Edition A sociological exploration of the causes and consequences of delinquent behavior. Juvenile Delinquency, Ninth Edition, explores what delinquency is, its causes and influences, and strategies for delinquency prevention. Beyond simply analyzing the problems of delinquency in American society, the authors also examine what can be done about delinquent behavior. The text follows a strong sociological focus and discusses how delinquency develops across a life course, including how it begins, persists, and/or how it terminates in the lives of individuals. The text is unified by the theme of delinquency prevention and offers evidence-based policy recommendations and suggestions for possible treatment interventions.